a) The email subject must be: ‘TIDAL HiFi Music Meets Hi-Fidelity Sound. b) The message field must include their name and it must state that proof of purchase information is attached. It must also state the retailer the participant purchased from. c) Participants must also attach their proof of purchase receipt (either a scan or photograph, please ensure that the full receipt is attached and viewable and that it is clear and legible, it must show the product purchased, the price paid, the retailer and the date of purchase). Jump back to the golden age of hip-hop with this modernised boom box wireless speaker from LG. Take the beat anywhere you want using the robust built-in handles and the impressive 22 hour battery life. Unlike the old days of fiddling around with a tape deck, all you have to do is connect your phone via Bluetooth and you’re ready to lay down all the Run D.M.C and Sir Mix-A-Lot you could ever want. And it doesn’t matter if the heavens open while you’re getting into your groove, as this model is splashproof so it’ll be perfectly safe. It even has a built-in lightshow, which syncs up with your music to create the ultimate club atmosphere wherever you are. This speaker delivers incredible sound thanks to Meridian audio tech. With LG’s amazing experience, and the expertise of Meridian’s tweaks, every sound is free of distortion. So you’ll enjoy those blockbuster movie moments in amazing clarity. This speaker truly packs a punch thanks to Dual Action Bass speakers. They act like mini bass drivers to give the lower frequencies added impact, pumping up the beat. As a result you’ll get brilliant audio, with a beefy bottom end that you can really groove to. 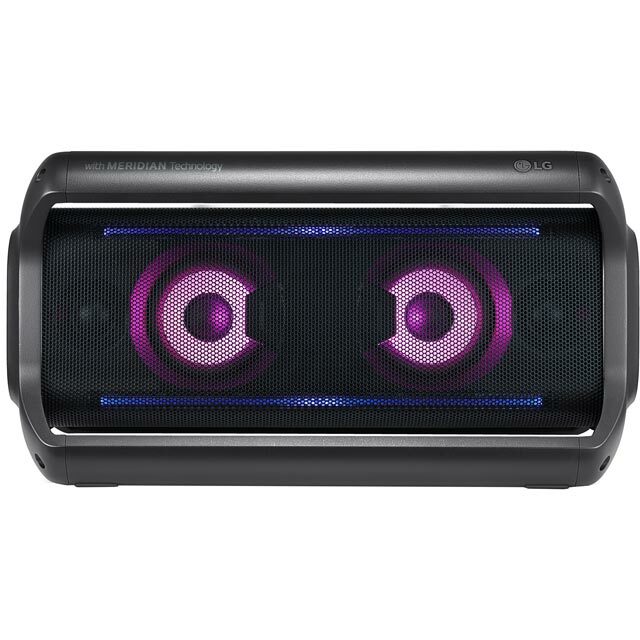 This speaker delivers clear vocals and enhanced bass in all your music. A pair of tweeters give a crisp top end, while the dual passive bass radiators ensure the beat still cuts through. As a result you’ll get brilliant audio, with every aspect of your favourite tunes highlighted in superb detail. One word, Brilliant- kids love it, excellent sound quality. This speaker is of a solid build, very robust to say the least. I like the 'grab' handles, makes it so much easier to carry from A to B. It's sound quality and volume is excellent. Fool proof connection to my phone. The LED's are okay, but I would like the option to turn them off. Very pleased with my purchase and would buy again. Recommended. This was purchased for my sons bedroom,he is thrilled with it,and I also think it is fantastic,love the flashing lights.Would make a very good Xmas present for teenagers or adults.Like the fact also that it does not take up to much room,the sound is very good,you can hear the base much better.Bargain price to. Does exactly what it says on the box. As good if not better than much higher priced competitors that I tried.